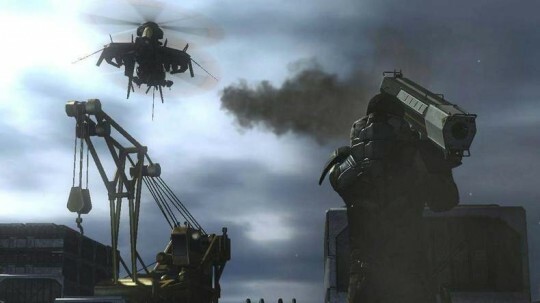 Kotaku has reported that Kojima Productions announced that certain boss characters in the upcoming Metal Gear Solid: Peace Walker for the PSP will drop items that can be used by the giant Wanzers in Front Mission Evolved, hinting at the PSP and PS3 connectivity between the two games. For the 360 version of FME, we suspect this will be turned into a DLC if it isn’t an exclusive arrangement between Konami and Square-Enix. We here in RR would like to think bigger regarding this partnership, so we’re further hoping for something like the Shagohod featured in MGS: Snake Eater or some new Metal Gear being featured in Peace Walker becoming side bosses in FME, much like how the popular Monster Hunter’s Tigrex will be appearing as special boss characters in MGS: Peace Walker. As much as the FME/MGS boss crossover is improbable, we would like to keep hoping that the possibility is still there. That, or we’ll be happy just having a Big Boss avatar for on-foot characters.